Size of Male: 60-79 lbs., 23-24.5 in. Size of Female: 55-71 lbs., 22-23.5 in. The good-natured, handsome Flat Coated Retriever makes an outstanding family dog. The Flat-Coat is versatile, happy and highly intelligent. Bred from crosses of early Labradors, Setters, sheepdogs and spaniel-waterdogs, this dog breed can excel in many dog sports. They are very devoted and affectionate to their families and form tight personal bonds. The more attached they become to you, the more they will try to please you. The Flat-Coat dog breed is the result of early crosses between the Newfoundland and Labrador Retriever in the 19th century, and later crosses with Setters, which give him his racier look. There were also crosses with sheepdogs and water-retrieving spaniels to help with his water retrieving abilities. The result was a dog called the Wavy-Coated Retriever which was later changed to the Flat Coat breed we have today. The Flat Coated Retriever is a loving family dog. They are bright, confident and outgoing with a strong desire to please. They are frequently described as being cheerful and good-humored. They love being with their families. The Flat-Coat is excellent with children and with other pets. However, as with many sporting dogs, since they are so friendly they don’t usually make very good guard dogs. Living Environment – The Flat-Coat is a very active dog and they do best if they have access to large spaces. They are very people-oriented and they do not do well as kennel dogs. Grooming – The Flat-Coat has a single coat (no undercoat) that is moderately long. The coat is easy to brush and groom but it does need to be brushed regularly. Diet & Exercise – This dog breed has normal dietary requirements but they do need a great deal of exercise. They are active sporting dogs and if they do not get enough exercise they can become destructive in the home. Without enough exercise they may also gain too much weight. 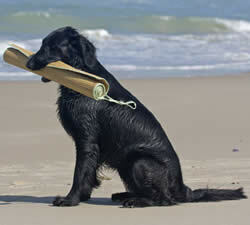 Health – The Flat-Coat has a somewhat shorter lifespan than most other dogs due to a higher than normal rate of cancer. Hemangiosarcoma, fibrosarcoma, osteosarcoma and malignant histiocytosis all occur in the breed at higher than normal levels. Flat-Coat breed clubs are sponsoring research into the problem. Canine hip dysplasia and luxating patellas occur in the breed occasionally, as does progressive retinal atrophy. Epilepsy can also occur. You should always talk to a breeder about health issues before getting a puppy. The Flat Coated Retriever is a very intelligent breed and they are very easy when it comes to dog training. They can excel in obedience, agility, hunting tests, flyball, frisbee and just about any other dog sport. They are smart and they have a strong desire to please their owners. If you are willing to work with them they can learn many things.